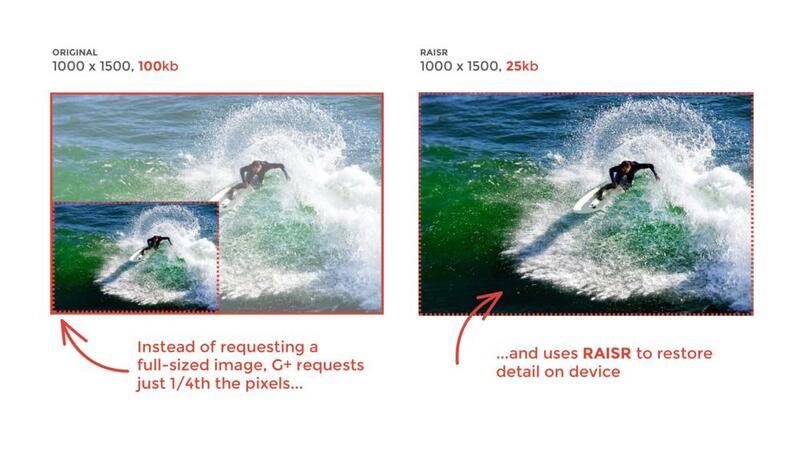 Hooli Google just released an image compression tool called RAISR (Rapid and Accurate Super Image Resolution) which is a tech designed to save you lots of data without sacrificing any image quality. Claiming to use almost 75 percent less bandwidth than any other tech, the compression tool RAISR analyzes low and high-quality versions of the same image at the same time. Once analyzed, it learns what makes the larger version better and emulates the differences on the smaller version. In short, using machine learning, RAISR creates an Instagram-ish filter to trick the eye into thinking the lower-quality image is on par with its original counterpart. Unfortunately for most smartphone users, Google claims the RAISR tech only works on Google+ where is apparently upscaling more than a billion images a week. If you don’t want to use Google+ for this, you’ll just have to wait a while longer. The good news is Google does plan to expand RAISR’s functionality to more apps over the coming months. If that includes Google Photos, it’ll be Christmas come early. Read next: Google search results are now suggesting the best torrent sites!